For new bettors, looking at the odds for the long list of MLB baseball games on any given day can be more intimidating than looking at a full slate of Sunday NFL action, particularly if you’re looking at the moneyline. Most people are familiar with the concept of a point spread and deciding whether a certain team is going to win by a certain number of points, and betting the moneyline is even simpler. When you’re betting on the MLB baseball moneyline, you’re simply trying to pick the winner of the game. 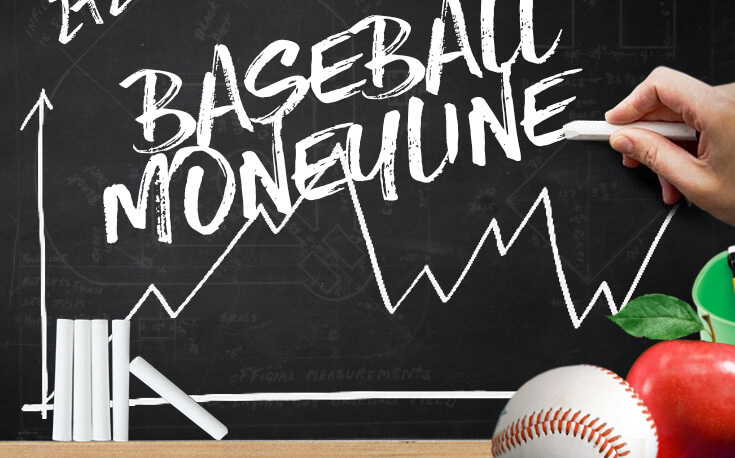 In this article, we’ll explain the baseball moneyline in greater detail, as well provide you with a few simple tips to use to your advantage when you elect to wager on the moneyline! The following chart is a snapshot of National League baseball games with moneyline prices for each game. There’s more than one moneyline only because the reference image shows odds from more than one bookmaker. Of course, odds vary across online sportsbooks. In general, moneyline favorites are listed as a negative number (-) and the underdogs are listed as a positive number (+). If both teams have negative numbers attached to them, the number closer to 0 should be regarded as the favorite. In the chart above, we see that that New York Mets (NYM) are about -150 favorites over the Giants (SFG), who are at roughly +155. In practice, that -150 number simply means that, in order to win $100, you have to bet $150 on the Mets. If the number is positive, like the one next to the Giants (+155 or so), it represents how much you will win on a $100 bet. That’s all there is to it! If only picking the winners was as easy as understanding the money line. Wagering on the moneyline in baseball is markedly different than wagering on the run line for many reasons, but chief among them is that odds will vary different between the favorites and the underdogs. Because betting on the run line requires a team to win by a set numbers of runs (or, only lose by a select number of runs) its considered a leveler between the two teams. As such, it is not uncommon to see both teams in a runline listed at -110, or something close. Because there’s no mechanism that accounts for the difference in quality between two teams like there is in the run line (as mentioned, moneyline bets are on the winner, straight up), moneyline odds vary greatly. In moneyline betting, it’s not uncommon to see one team listed at +150, and the other at -190, for example. So, if you’re betting on heavy favorites, you’re going to have to win a lot in order to break even. Here’s how it works. The chart below shows what your expected win-rate needs to be to break even at various prices. The following is an even more simple way to look at it: if you make twenty bets and win ten, you are a 50% bettor. This means you’re losing, on net. If you turned one loser into a winner and sat at 11-9, you’d be a 55% bettor and, thus, profitable. However, in baseball, it is entirely possible to win 50% or less and make money. All you have to do is successfully bet on underdogs. Easier said than done, but wholly possible. Here is a recent example of six games played last year the Toronto Blue Jays, complete with the opponent, the price, and the result of each game. As you can see, Toronto went .500 over that six-game stretch, winning three and losing three. Assuming you made a $100 bet on all six games using the -110 we are familiar with, you would have lost $30. But the actual moneyline wasn’t the standard -110 for any of the games. In reality, betting $100 on the Blue Jays in all six games would have landed us a $95 profit; they were the underdog in five out of six, including all three wins. Since the biggest risk on any one game would have been $100, our ROI, return on investment, was roughly 15%. That is a difficult ROI to attain/retain betting on expensive favorites, as we will see next. Below is a recent set of six games the Cubs played. As in the Toronto example, the Cubs won three and lost three. As you can see, it was very expensive to bet on Chicago against the Phillies, a team that’s considered weak. Over the course of the three games, you had to bet an average of $190 on each game in order to win $100. Yes, the Cubs won all three, but the return on investment wasn’t great. The Cubs then lost their next three to the Yankees, despite being favored in each one. So, all in all, they went exactly .500 over the course of those six games, just like the Blue Jays. However, betting $100 on all six Cub games would have lost us $75. Let’s look at the specifics. The average price of the Cubs over the six games was -157, which would mean we would have to win 61% at that price just to break even. To translate that into even simpler terms, a baseball team that wins 100 games over the course of the season wins 61% of their games. There are some seasons that no team wins 100 games. Since we have seen how much these numbers matter, it is time to take it one step further. Let’s assume we have decided which team we are going to bet on. In order to get the best payout, you’ll have to find the most favorable odds across online sportsbooks. To learn how to find the best value on the baseball moneyline, check out our guide to successfully line shopping at online sportsbooks!